Midnight Oil 2010 – Tickets on sale now! August 6-7 will see the return of Midnight Oil Summit – one of the major events on my calendar since its launch in 2007. Described as a national kingdom youth revival, it’s a dynamic coming together of music, worship, teaching and a lot more than I can fit into this blog post. 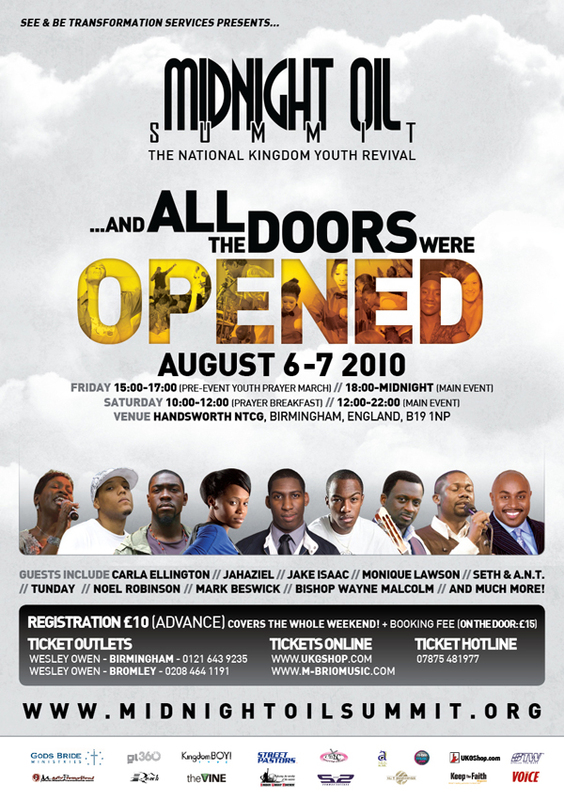 Seth Pinnock and his team have once again arranged an impressive lineup featuring Jahaziel, Noel Robinson, Monique Lawson and Tunday. This year will also see the return of Bishop Wayne Malcolm. They will all be part of a packed event that also promises a youth prayer march, interactive seminars and prayer breakfast. Yes, MOS is an event that will feature some great music but what makes this event unique is that it’s so well integrated into the programme that it flows perfectly. If it’s anything like last year, it’s sure to be an event to look forward to. Expect a powerful, buzzing atmosphere of praise. Don’t expect to leave the same way you came. Next Post Get your skates on!